This beautiful 4500 sq. ft., open space home. is nestled on a 6+ acre wooded lot. Perfect for entertaining. Featuring hardwood flooring. Boasts beautiful custom window coverings. The inviting living room has vaulted ceilings, with ceiling fan and gas fireplace. An elegant formal dining room has access to the low maintenance composite deck, with motorized awning-perfect for those hot days. Kitchen has designer touches-stainless steel appliances, granite counter tops, full subway tile backsplash, cabinets with pull-out lower shelving, generous breakfast bar. Adjacent to the kitchen is a butlers pantry, with even more storage, and counter space. The master suite is truly an oasis, with vaulted ceiling and gas fireplace. Its en suite bath features two sinks, large tub, extra large no curb shower, with water jets, and hand wand. private toilet area. You will find the closet of your dreams, fitted with hanging rods, shelves, full length mirror, and wall safe. The three remaining large bedrooms, each have en suite baths and generous closets. Large laundry area with space for washer and dryer, deep sink, lots of cabinet space and counter top. Imagine watching the game in the 800 sq. ft. finished basement space, including full kitchen and bath, display shelves with sliding glass doors, and access to exterior stamped concrete patio. A 3 car garage is equipped with electric garage door opener, and tons of storage space. A separate 800 sq. ft. building, with separate shop space, lounging area, and full bath ( independent HVAC ), is the icing on the cake, for those who enjoy do it yourself projects. 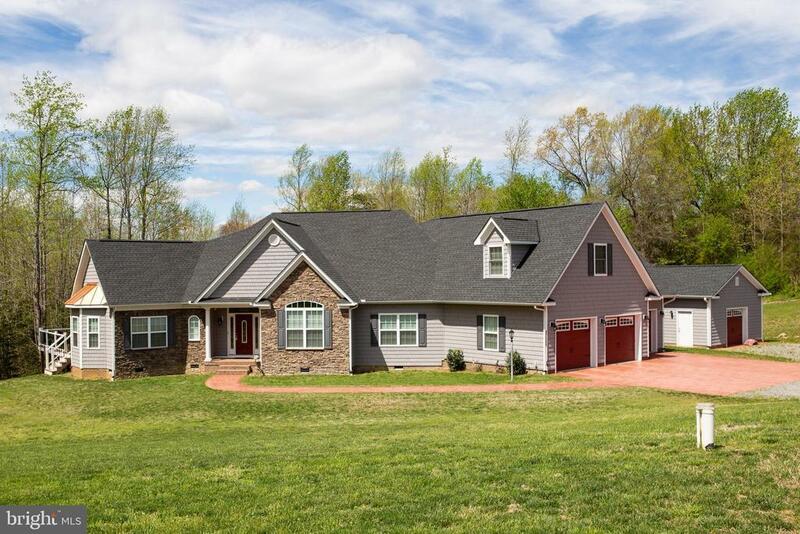 Home comes with its own well, septic system, and full house generator for emergency power. Directions: Rt. 2 S from Fredericksburg. Through Bowling Green, cont. S on Rt. 301 about 1 mile. L Rt. 640 (Wrightsville Rd.) about 1/8 mile to home on L.